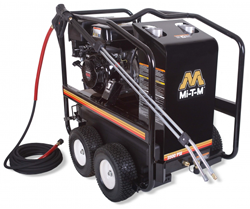 One Source Equipment Rentals has gas powered hot water pressure washers for rent or sale from Mi-T-M, Pressure Pro, and Shark. Like cold water pressure washers, these units are designed to clean dirt, grime, and loose paint, from the surfaces of buildings, equipment, storage tanks, and concrete. Their diesel/kerosene fired burners raise the water temperature to aid in cleaning oil and grease from the surface. Detergent injectors offer the ability to add cleaning solution in-line and reduce the time it takes to clean.